Based on William Joyce's the Guardians of Childhood book series, Rise of the Guardians is a gorgeously animated film about Boogeyman Pitch Black's attempts to spread darkness and fear throughout the world and the guardians' attempts to foil him. Charged with the duty of watching over the children of the world, guardians Sandman, North, Tooth, and E. Aster Bunnymund are loved by children everywhere. When the Man in the Moon appoints Jack Frost to be the newest guardian, the other guardians doubt that Jack can be of much help against Pitch, especially considering that the children don't even believe in Jack Frost's existence. 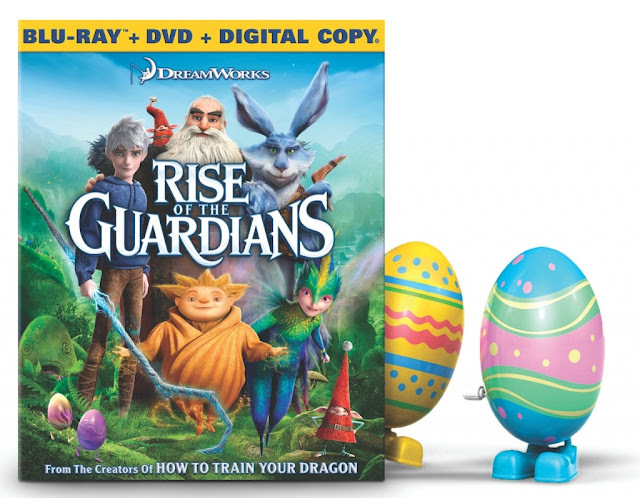 But when Pitch prevents Tooth from collecting the children's teeth, keeps E. Aster Bunnymund from hiding eggs on Easter, and turns the children's happy dreams into nightmares, the guardians realize that they're going to need all the help they can get. The children stop believing in the guardians one by one, and the question that remains is what can one fun-loving, somewhat immature boy with the power to freeze everything he touches possibly do to counteract the fear and darkness enveloping the world? Another great party viewing pack, but this time for the movie every kid I've talked to has been waiting to see, Rise of The Guardians. Let me tell you how excited my kids were to receive this package when we came back from our trip to California. They were screaming up and down when they saw the reusable bag with all the characters on it, because they already knew what was in it. Or so they thought. Not only did we receive the movie on blu-ray and DVD, but we also go some goodies and treats that the kids can enjoy. This included a night light, Easter candy, planter, watering can, tattoos and so much more. The kids were so happy and I was pretty please on the viewing pack as well. The movie itself, awesome! It was what we expected it to be and more. I wasn't disappointed at all. It has something for everyone. Lots of humor that the kids enjoyed and some older humor that made my hubby and myself chuckle at too. This was a great movie to curl up to and is perfect for the entire family no matter how old you are. I definitely recommend having this be the movie you and your family watches on your next Family Movie Night! Disclosure: All opinions are my own. I received Rise of The Guardians party viewing package at no cost for the purpose of this review. No other compensation was received.